I don't know, I think Leslie Townes Hope would be a great name for a comedian and all-around show biz icon. LT Hope, perhaps. 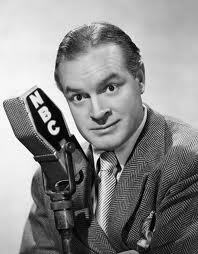 But we know the man born on this day in 1903 not by his birth name but as Bob Hope. Self-effacing but razor-sharp, wholesome but with a racy edge, Hope had wide appeal and will go down in history as one of the top comedians of the twentieth century. Like all the big stars of the Depression and World War II eras, Hope was versatile enough to thrive in various media: film and radio, and later television. His biting monologues sizzled on the airwaves to American homes on The Pepsodent Show. He then began broadcasts on military bases, entertaining overseas troops, something for which he would go on to be best known. 1943 would take Hope into perilous locales in Sicily, Ireland, Africa, and England, with his USO troupe made up of Jack Pepper, Tony Romano, and Frances Langford. In the upcoming years, he'd entertain servicemen and servicewomen fighting in the Vietnam War and in Beirut, wherever there was an armed conflict. Often this would come in the form of a Christmas show. This service gained him the nickname #1 Soldier in Greasepaint. Hope lived a hundred years and entertained for seventy of them. He is #1 in longevity and versatility. Happy birthday, Bob Hope!